A few weeks ago I talked with a woman who used to work in radio including at the local classic rock station. I complained to her about how you only hear the same songs over and over and asked why. She said that’s what the listener wants. 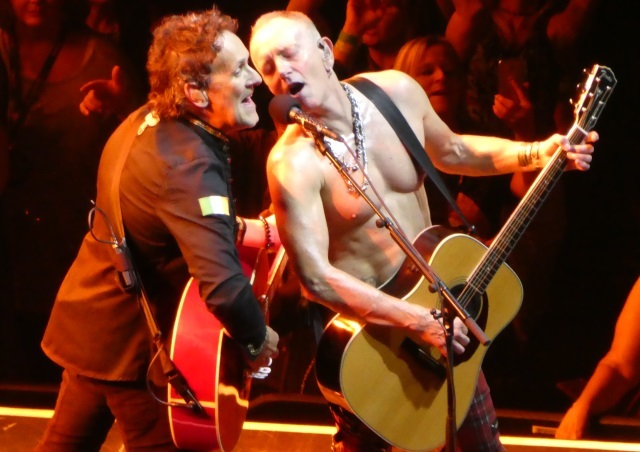 Def Leppard and Journey thoroughly filled the Moda Center on Friday in Portland, one of the biggest crowds I’ve ever seen there, on their co-headlining tour consisting mostly of all those songs you hear on the radio. Both bands, who catapulted to the top of the charts in the 1980s, played full sets and reached back three decades for all those #1 smashes. Journey took the stage first opening their 14 song set with “Separate Ways (Worlds Apart)” and peppered the evening with a few outright solos from guitarist Neal Schon, a stellar drum solo from long time percussionist Steve Smith and Jonathan Cain also got in on the spotlight with a piano solo. Actually Journey did toss in some deeper album cuts with the title track to their 1983 multi-platinum album Escape and “La Do Da” off Frontiers now 40 years old, both defeating father time quite well and sounding rather up to date. But the evening belonged to their radio hits and those songs that have kept fans in their pocket for so many years. I won’t bother getting into the whole history of Journey, a research paper in its own right, but if you haven’t been paying attention they have found a more than solid replacement for vocalist Steve Perry in Arnel Pineda. It really is amazing to hear those near iconic vocals from Perry come out of Pineda who began his tenure with Journey in 2007 and has fronted two albums with the band he once covered. He runs around like a ball full of energy at times, clearly enjoying his gig. 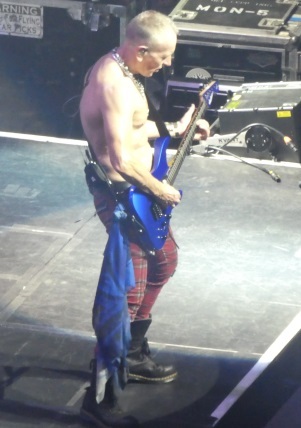 Schon just one of two original members (along with bassist Ross Valory) ripped off numerous guitar solos that helped add some additional depth to songs and grabbed the spotlight outright on several other occasions displaying his prowess on the fretboard. Journey has certainly seen a revolving door of musicians over the years but have managed to keep intact a solid core who have been on the payroll for nearly 40 years. Regardless, Journey tours and tours, almost endless it seems, ($50 says the band will be on tour in 30 years in some form or another!) and continues to delight audiences perhaps giving into some youthful yearning for those who long for yesteryear. Overall, Journey produced a solid set, nothing remarkable though, and perhaps some wear and tear showing on the tail end of a 60 date tour but the energy switch from them to Def Leppard was palpable. Indeed most in attendance were there for Def Leppard who at this point could sleep walk through their show. The band has not changed their set list much in the last 10 years and if you’ve seen them once you have pretty much seen all they have to offer give or take a couple of songs. Even the video backdrops have been around the last few tours and their cover of David Essex’s “Rock On” always makes an appearance. Regardless, Def Leppard consistently put on an energy packed show, which the audience helped drive as the lights dropped, and Friday wasn’t anything less. The band started their 16 song set with “Rocket” and hit all the popular radio fare including half of their smash album Hysteria which hit 30 last year and the band was supposed to tour in its entirety, at some point. Still waiting. Guitarists Phil Collen and Vivian Campbell traded on lead flawlessly all evening (really odd to see Collen way down there on the big stage when I saw him earlier this year at a really small venue as part of G3) and the band did doll up some portions of the show with lasers and lighting. Drummer Rick Allen did his usual drum charge which the audience laps up every time. 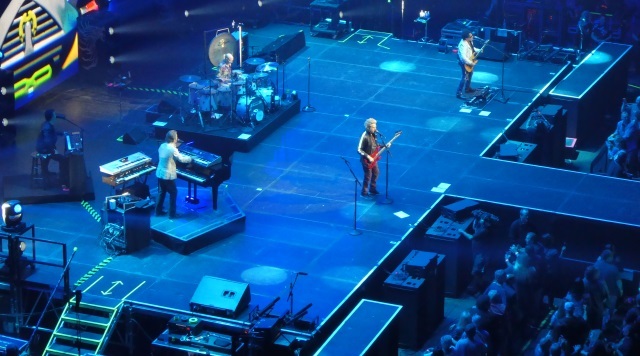 And all five members took to the catwalk for the acoustic “Two Steps Behind.” Like Pineda though, singer Joe Elliott’s voice sounded like he needed a rest and though the band didn’t mail the performance in, perhaps they FedEx’d it. Def Leppard, too, has a solid latest album in their eponymous 2015 release and they played just one song “Man Enough” from it. But who am I to complain? Their songs pass the test of time for a reason and if that’s what the listener wants that’s what the audience gets. “Pour Some Sugar On Me” and “Photograph” – always a delight. Singer Joe Elliott said they’ll keep coming back as long as the crowds come. Well, the crowd came and I have no doubt Def Leppard will be back. Just change the setlist a little. Please? Def Leppard does not really deviate from the go to setlist which is shame but I get it as those are the tunes people wanna hear! 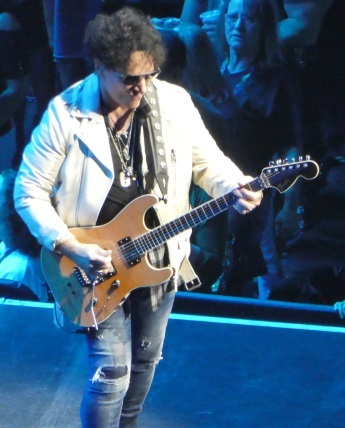 I got a Neal Schon review coming up in a few weeks..check it out.. Thanks deke. I will. Looking forward to it.